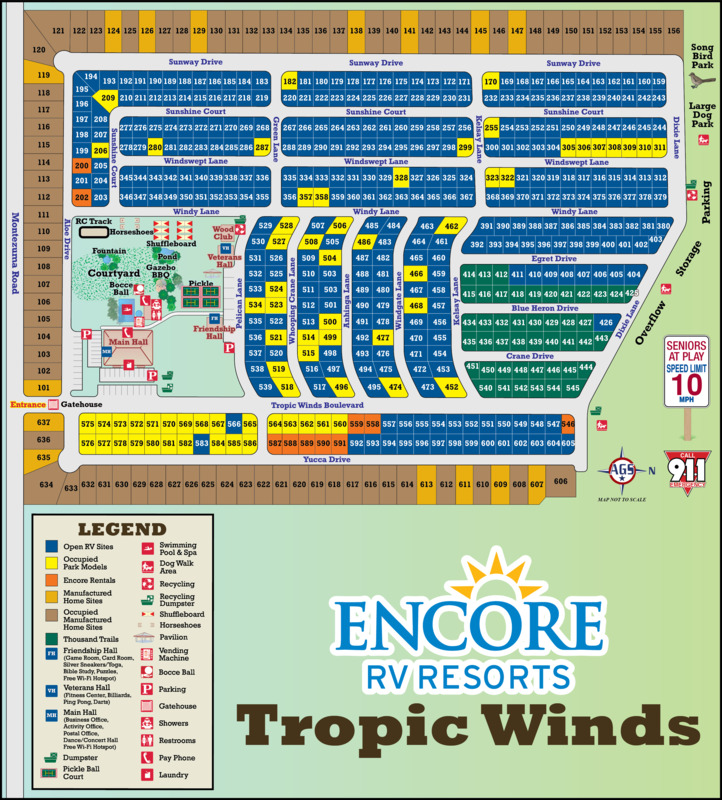 Ask fellow campers about "Triple T RV Resort" and nearby attractions. I don't know where the previous reviewer stayed, but it WASN'T at Triple T. The rate I posted is based on monthly stay. We arrived here Novemner 1 and have found the staff to be very friendly and accommodating. The restrooms are clean. The lodge is a beautiful building. We had a Thanksgiving potluck in it, and there is a Super Bowl party planned for Sunday. While walking our dogs, we have yet to see any trailers in bad shape. We haven't had any problems with the utilities. The water is from a well. We aren't fond of the taste, but that was remedied by using a softener. Every once in a while you see law enforcement drive thru the campground. But that's common everywhere you go. We have seen no fighting or signs of drugs. There are quite a few permanent/long term residents, but sites are neat and tidy. We are "Winter Texans" who are planning on making Triple T our permanent home when we quit heading north for the summers. We camped at Triple T RV Resort in a Fifth Wheel. We stayed here a year ago and it was great, but it is now under new management. Don't drink the water! We'd suggest not even hooking up to the water. Fleas and stickers kept our dog miserable and now our coach is full of them. Management has no idea what they are doing and every now and then the owner arrives to scream and cuss at people. The police were on the property three times during our stay. There are a lot of run down mobile homes and cabins where shady types live full time. Some look like drug dealers. Problem with electric and water. Constant back ups with raw sewage on the ground. This place smelled like sewage. Pool has no heater. Road noise is too much and their lodge smells like raw sewage. There are a lot of "RVers" who haven't moved in years. We saw a lot of drinking and fighting and it wasn't like this before. We will never return. It used to be so great and friendly and now seems like it is a place for poor people to park and live forever. We miss the Triple T from 2017. We camped at Triple T RV Resort in a Motorhome. Very nice park, check in was pleasant and helpful. Sites are gravel and fairly level. Did not use any of the facilities, as we were just traveling through. Would definitely stay here again. We camped at Triple T RV Resort in a Fifth Wheel. We stayed here overnight, using our PPA. It was abnormally chilly (mid 40's), and we didn't use any of their facilities, but they have a nice pool, hot tub, and clubhouse. Also gated security. We had a nice pull-thru, which is great for an overnight. Good cable TV, and internet. Definitely will stay here again. Site was level gravel, with a nice grass yard. We camped at Triple T RV Resort in a Travel Trailer. The better sites are at least 3 or 4 rows away from highway. Highway is pretty quiet at night so for one night stand it probably won't matter. Sites are modestly level, big motorhomes may end up with blocks. Well cared for strip of grass between sites - most have a tree at the front that will not block roof mounted SAT antennas. Utilities well located & steady. Every site has a mail slot in the office, so if you stay long enough this is a good place to let your mail catch up with you. Another plus for longer stays is special passwords for high speed wifi - suitable for Netflix and other streaming services. Std free wifi was doable but very slow at peak times. Overall appearance of park is tidy and neat. Coded entry gate for access to park after hours for better than average security. Seems rules are enforced - except speeding. A big plus for this park IMO is for bike riders - VERY wide (usually 6 ft or more) and clean shoulder on the highway in front of park. Slightly rolling hills and the wide shoulder make for a good workout, relatively safe and scenic ride. The chip seal shoulders might be a bit rough for road bikes with narrow high pressure tires. My 2 inch small block 8 tires made for a smooth and quiet ride. Don't know if sand burrs mentioned previously are seasonal or not but they were not a problem during our stay I even went barefoot on our grass. We camped at Triple T RV Resort in a Motorhome. Eat lunch at Camp Verde. Great service, good food and reasonable prices. Reservations or get a pager and shop in the big store while waiting. I rode with one mile of Bandera. Side roads are even better and with very little traffic and exotic animals including a zebra. Turn right out of park and first paved road on right is an excellent viewing road. Bike or drive quietly down side roads looking hard wherever there is an eight foot high fence. Not exactly a petting zoo - but owners long horn cattle were fun to watch - as well as deer that frequently enjoyed the easy pickens food set out for the cattle. The cost was based on a one week stay. We found the folks at the park very friendly and accommodating and we very much enjoyed our stay. It's a very nice well maintained park and our site was fairly level with our jacks able to compensate. It's out in the country fairly near Kerrville. We camped at Triple T RV Resort in a Motorhome. Points are for the pull through site being long enough that we didn't have to unhook the truck and there was room for my car and trailer I use to pull our 4 wheel bicycle. The price reflects Passport America. I would have been very upset if we had paid full price. Free Satellite TV is listed in the amenities. It is 12 channels and in my opinion does not qualify as an amenity. Free Wifi is also listed. Sorry, .39mbps is only dismal service. Having to wait 5 minutes to get a result from a search is not worth the effort. There is indeed much road noise and the location is farther out if town than we would have preferred. There are better options in Kerrville. We would not stay here again. We camped at Triple T RV Resort in a Fifth Wheel. What a great find! We had a pull-through site near the bathhouse. And for all the traveling we've done, this was by far the greatest bathroom facility encountered! It was heated and spotlessly clean! There were multiple private bathrooms for total convenience. The building also housed the laundry, a dish sink, and a workout facility. I would most definitely stay here again! Thank you! We camped at Triple T RV Resort in a Fifth Wheel. Called ahead due to arriving on a Sunday. We we're given the gate combination and told to call back upon arrival. Outstanding customer service. Site was fairly level with good 50 amp electric and water pressure. Goat heads are everywhere so if you are walking a pet watch out. A little way out of town but worth the drive. A little road noise but nothing really bad. Good 2-bars of 4g Verizon service and no problem getting a DTV signal. Thanks y'all for another good stay. We'll be back. We camped at Triple T RV Resort in a Motorhome. Billy Gene's for supper. Excellent. We stayed one night. The traffic noise was terrible. The park was nearly empty, now I know why. The grass between the sites was dead and full of stickers. We were charged $20 even though the PPA shows the price as $17.50. We called ahead since we were arriving at around 5 pm. The campground was gated so we have to push the call button to open the gate. The manager opened the gate remotely. As I pulled forward to go thru the gate it started to close. The closing gate hit the front of my RV. The next day I waited until the office opened at 9 am. I talked to the manager about the damage. She said she would have to have the OWNER look at the damage. I waited for an hour but the owner did not show up. WE would not stay here AGAIN. We camped at Triple T RV Resort in a Motorhome. This campground would be good for an overnighter, but it's 5 miles from town and 10 miles from I-10. We stayed two nights. The site we had (#2) was very unlevel, but sites closer to the road look much better. They advertise cable TV, but there are limited channels. The laundry room is very narrow, but it does have a table for folding clothes, an iron, and a chair for you to sit on while you wait for your clothes to get done. There are 6 washers ($1.50) and 8 dryers ($1.50). Everyone at the campground was very nice. 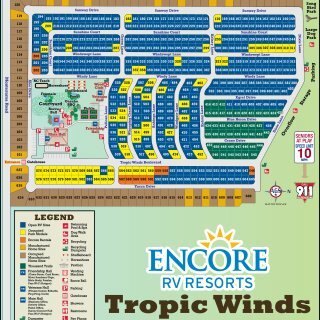 We camped at Triple T RV Resort in a Motorhome. HEB is a fantastic supermarket. A nice resort park that was undergoing major updates to their facilities. They were adding a number of rental cabins. The sites are adequate in size and the park was quiet. Well outside Kerrville, it is still an easy drive. A locked automatic gate provides security and the combination is provided when you check in. Cable is actually 12 stations provided by Dish network. WiFi worked well at our site. We would stay here again. We camped at Triple T RV Resort in a Motorhome. Many places to eat and shop in Kerrville and Fredericksburg and scenic drives in the Texas Hill Country. Best time to visit is in March when the Bluebonnets are blooming. Owner was helpful by phone for after hours check-in. Paid next morning. Office lady not friendly. We used nice laundry, few cardio machines in exercise room. Very noisy area with lots of traffic on highway. Garbage dumpster overflowing. Would have stayed a 3rd day but office lady wouldn't allow Passport America rate even though park mostly empty and we asked for manager to discuss. We camped at Triple T RV Resort in a Fifth Wheel. Great many sand burrs and was carried into MH and carpet. We camped at Triple T RV Resort in a Motorhome. Eat lunch at Camp Verde. Great service, good food and reasonable prices. Reservations or get a pager and shop in the big store while waiting. I rode with one mile of Bandera. Side roads are even better and with very little traffic and exotic animals including a zebra. Turn right out of park and first paved road on right is an excellent viewing road. Bike or drive quietly down side roads looking hard wherever there is an eight foot high fence. Not exactly a petting zoo - but owners long horn cattle were fun to watch - as well as deer that frequently enjoyed the easy pickens food set out for the cattle. Are you affiliated with Triple T RV Resort ?